Three decades ago, job opportunities like blogging, for example, did not exist. In fact, thirty years ago you could get a new car for less than $10,000. For the past thirty years, we have seen a tremendous change in different sectors; most noticeably the advancement in technology which has led to new opportunities in the job market. Research suggests that 65 percent of children joining primary school today will end up working in new job types that aren’t even discovered yet. 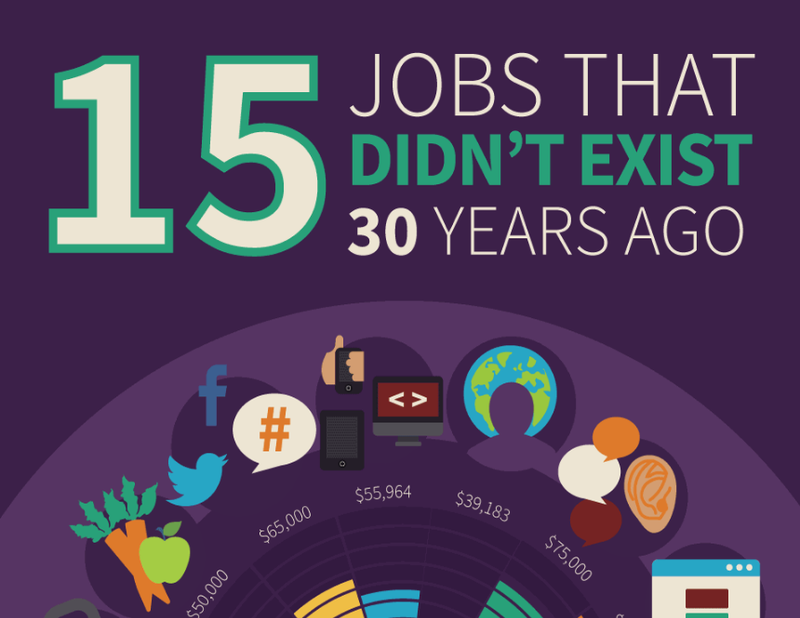 We have rounded up a variety of new jobs that never existed thirty years ago. These jobs are not just limited to the improved technology, but some of them have resulted from changes in lifestyles, such as the demand for products related to fitness and nutrition. Have a look at this list and find out more about the latest jobs you may not have heard of. Blogging has grown to be a big business today and bloggers are like celebrities. Originally, blogs started as online diaries and later grew in popularity in the early 2000’s where they began gaining a wider reach. Even after then it took a while before blogging can be recognized as a profession. Although it can be hard to break through and turn your hobby into an income generating venture, it can be done. For instance, take the Huffington post. This website is the world’s most popular blog with over 110 million monthly users. But they are not the only one who has made it big in the blogging industry, we have Forbes, and much more who happen to be multi-millionaires. This app-based ride company started back in 2009, but it has grown to become the world’s transport giant valued at close to $62 billion. This has created a lot jobs for drivers. In fact, in 2015, Uber is said to have doubled the total number of active drivers across the US, and the company continues to unveil new services in new cities across the world. Some of the job requirements for you to be an Uber driver are as simple as safe driving, time management, good communication, and customer service. Research shows that by 2013, the cloud computing specialist jobs increased by an overwhelming 1,700 percent. And it’s here to stay. Cloud computing started back in early 2000’s but it has taken off in the recent years. It was mentioned at a Google conference in 2000, and since then it has been growing tremendously especially in the world of digital marketing. The main role of a cloud service specialist is being skilled in devices, mechanisms, technologies and anything related to cloud storage services. No one thought that there would be drones that would require special skills to operate. The truth is drones are being used by many organizations including the military, which was their main origin and now they’re common in filmmaking, real estate, and advertising. Big companies like Google and Amazon are testing ways to deliver packages using a drone in future. According to a report released by the Association for Unmanned Vehicle Systems International, it was projected that there would be more than 100,000 new jobs being created in the unmanned aircraft by 2025. To match the increased demand for jobs that require special skills to operate drones, several training programs are being introduced in institutes and universities across the world. Virtual assistants are more of contract freelance secretaries who do their jobs from home. They focus on administrative tasks. Due to the availability of the internet, it’s easy to get some amazing management tools to help you do this job from anywhere. Ideally, you need to offer assistance to different clients by making vendor or customer service calls to send a thank you card to clients and book keeping. It’s a common field in the US and it’s slowly growing in other parts of the world. It offers a perfect opportunity to work from anywhere in the world. The marketing field has experienced massive changes over the last few decades and it continues to grow every day. Thirty years ago, most marketing was offline. Emailing was the big deal back in the day, we had no social media marketing and all others strands of digital marketing that we see now. Thanks to advanced technology, digital marketing experts are being needed to help companies come up with good marketing plan and strategies to advertise online. A digital marketing manager helps to plan and manage the digital marketing elements of a marketing plan in an organization. They need to coordinate with a team of printers and public relations to ensure that the company’s marketing objectives are achieved. Social media is where people can connect and it has become a platform where business can advertise their products and services. As a result, a lot of job opportunities have been created as individuals and companies need experts to manage their social media pages. Three decades ago, there was no Facebook, Twitter, Instagram, and other social media platforms. A decade ago, Facebook was in its infancy, Twitter was just starting, LinkedIn was just a year old but still not known. Today, about three-quarters of the world population are on social media in some way. This is where a social media manager comes in. Their responsibility is to manage the company’s social networks. Social media is a massive channel where different brands get to interact with their customers to improve their purchasing power. So, you need a social media guy to manage all the activities in your social media accounts. Many people wouldn’t know what SEO stood for back in the 2000’s. Search Engine Optimizations has become an important part of the digital industry. An SEO specialist is responsible for making sure that the company’s brand including products and services are easily found on search engines. If you intend to start an online business, you will want to be seen once someone searches for your product or service. An SEO specialist will help you improve your website's metrics to get you to the first page of search results so that your brand shows up once someone searches for specific keywords. Self-driving cars are set to wipe out the common roles of taxi drivers and couriers. They are also set to change the way we see technology with advanced innovations in robotics, computer vision, machine learning, and mechanical engineering. They are creating some new jobs, therefore, there is increased need to learn the special skills and techniques used by the creative team involved in self-driving car technology in some of the most innovative companies in the world. Although driverless won’t repair themselves, there will be increased demand for mechanics, engineers, and software developers in future. At this age, you must have watched at least one video on YouTube and you understand how powerful it is as a marketing tool. Thanks to YouTube and several other video sharing networks, video blogging is now a full-time career and there are so many YouTube millionaires out there through social media management, advertising, and sponsorship deals. If you think you are funny, knowledgeable and charming enough to make great content in front of the camera or even behind the scenes, you just got yourself a profitable career. If you have the right skills in video editing you can get a job in an entertainment company as a producer, director or scriptwriter. There is no doubt that a healthy diet is essential in everyone life. So, you shouldn’t be surprised to find that nutrition is one of the fastest growing fields in healthcare. Three decades ago, there were fewer cases of obesity. But, it’s on the rise now and more people are willing to pay thousands of dollars to lose weights meaning that there is increased demand for nutritionists and dieticians. The trend is expected to continue and the Bureau of Labor Statistics indicates that the demand for nutritionist may grow by 21 percent by 2022. Nutritionists plan for food and nutrition programs. They also supervise the process of food preparation to ensure healthy eating habits are adhered to. In the recent years, the demand for Zumba has skyrocketed, but it started in the early 1990’s. It has been become widely known as the energetic dance choreography that involves samba, mambo, hip-hop, and salsa. To become a certified Zumba instructor, you need to achieve a general group certification to equip you with the necessary skills and knowledge needed to deliver exercise sessions to different people and fitness levels. Before, we never had of online jobs or marketing. But today the worlds want to be online, but only a few people understand the benefit of the web. Understanding how the web work is key in developing your business on this ever changing platform. This demand has created new careers options for web analyst who understand how the platform works. A web analyst is responsible for analyzing the website data to come up with ways to increase their web presence. The analysis can also help the company to make informed decisions to achieve their goals. A web analyst must have good knowledge in concepts of marketing, statistics, and technology to be able to deliver the best results in this career. They should also be ready to learn new trends related to the job since it’s an ever-changing platform. Mobile apps have been around for the last one decade. Before, we did not hear of the iOS App Store, Google Play, and much more. As a result, thousands of new jobs have been created in the digital economy. Every smartphone has an App store where you can search and download any app you want. This has increased the demand for App designers as more apps are being created to make life easier. For instance, Apple hit a massive 50 billion app download recently. App designers are responsible for designing the graphics and creative apps and their updates to add to the large pool of apps across Apple and Android stores. For professional scientists who want to use their skills and knowledge in genetics to help patients can become genetic counselors. It’s still a young career, but it presents exciting options to those who are committed. In fact, in 2014 there were only 2400 genetic counselors employed in the US, according to a study by the United States Bureau of Labor Statistics. Currently, there are more than 4000 qualified genetic counselors in the US and Canada. A genetic counselor is responsible for assessing individuals who are at risk for various inherited conditions such as birth defects and genetic disorders. They provide advice and support to them to help them avoid falling prey of the inherited conditions. It’s one of the lucrative careers we have. There are plenty of career paths in the IT industry. But, mobile app development has seen a tremendous rise of late. With an estimated population of 4.88 billion mobile phone users across the world, mobile devices have become essential elements in our lives. This means that there is increased demand for mobile apps for every task from shopping to playing video games to designing and much more. The growing startup scene has also led to the increased demand for mobile app developers. Most of these companies are prepared to pay huge packages to get the best app developers aboard. App designers work together with app developers where the developer uses the work of a designer to implement the design into a code. The result is a brand new app. The app developer makes the app functions as it’s supposed to so that the users can access every feature of that app. Imagine getting paid just to listen to clients and potential customers of any organization. A chief listening officer will get rewarded if they have excellent listening skills. However, they will need to show years of relevant experience to gain the trust of clients. A CLO will provide solutions and insights to make an improvement in the company’s client interaction. For instance, if a customer leaves a bad review on your Facebook page, the CLO will send the information to the Customer Service Manager to have the matter looked into. Or when a company runs new marketing ads that resulted in positive reactions on social media, you give the marketing department a heads up to keep posting the same type of ad campaigns. Although CLO is a new role, it keeps growing since customers keep on airing their grievances about the services of a company. And every organization needs a person to pay attention to these issues. At this age, online security breaches are on the rise across the world, with hackers targeting to steal valuable information from large and small businesses. An Information security analyst is responsible for safeguarding the organization’s data and information from these attacks. They also help to plan and implement security measures to protect a company’s computer systems. They need to be updated on the latest intelligence including hacker’s tricks, in order to identify security breaches. Every company needs an information security analyst to safeguard their networks and data. Sustainability has been growing for the last decade with job opportunities in humanities, sciences, and social sciences popping up. Sustainability professionals focus on promoting environmental protections, profitability, and social responsibility. They help employers conserve resources, create new and improved technologies or services, and educate people about environmental issues for efficient planning. As a sustainability director, you’re responsible for advising an organization on environmental matters related to the use of resources in a responsible manner. User experience or UX designers are responsible for designing the layout and functionality of websites to provide a more user-friendly experience to customers. They research the recent technology trends, meet different clients to help them with their websites, decide on the type and content of graphics of a website, test the usability of websites, and much more. Their expertise is needed in the e-commerce platform where the user’s experience of websites determines whether a customer will purchase a product or not. Every business owner with an online business requires the services of UX designers. So, these twenty jobs that were unheard of three decades ago are shaping the world of business and driving the digital economy. There is a lot of transitioning taking place so, it’s possible that we will continue to see new jobs popping up the coming years. They are here to stay and you might try your hands on one based on your skills and expertise. Samantha Anderson is Educator and blogger. She applies her educational experience to writing study tips for students on her blog and writing research papers for writing service WriteMyPaper.Today. Samantha loves teaching and is an open-minded person that always looks for additional ways to self-growth.